No matter your hunting passion, we are sure to have a solution for your needs. You will have an opportunity to work with one of the most detailed hunting teams available today. Like most in our industry, the outdoors is their passion but we feel we are able to take it to the next level by understanding what it takes to not only choose the best hunting option for your specific needs but also how to ensure that you have a memorable experience with no detail left out. When it comes to hunting around the globe, there are no doubt plenty of choices, sometimes too many choices, that’s where the Outdoor Solutions team comes in to make sure your time and money are well spent on your next hunt. We have been fortunate enough to travel a great part of the world and have been on some hunting experiences that we will never forget. Still today our all-time favorite places are still right here in North America. We believe you will be hard pressed to find a more diverse continent when it comes to terrain, temperatures, elevations and species to hunt. 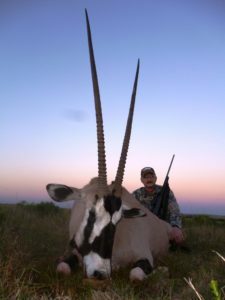 From something as simple as a wild boar hunt in South Texas, an upland hunt in Nebraska, to something more exotic like Dall Sheep in Alaska, or moose in British Columbia, the Outdoor Solutions team will have a hunt for everyone. When we have the opportunity to visit with our hunting clients, one of the most common questions is; “what is your favorite area to hunt”? That’s a really tough one to answer, Alaska always comes to mind, along with British Columbia. Both hunting areas have easily satisfied our need for solitude, as well as challenge us physically and mentally. I believe the area that surprised me the most in the way of beauty and ruggedness was the first time I hunted in Idaho, first in the Salmon area and then a few years later East of Lewiston on a pack in hunt along the Selway River. I will never forget our guide telling us we didn’t need to worry about getting lost because there were only two directions, straight up and straight down. He was not lying! With all that North America has to offer in the way of hunting we find it is still hard to beat the sound of a bugling elk, 30 yards away while you are at full draw! The mountains of the West bring us back year after year in pursuit of what is arguably the most exciting big game animal to hunt in North America. If Big Game is not your preference but something with feathers is , we have plenty of opportunities for you as well. One of our favorite places is our Nebraska destination where we host our annual upland hunt with exhibition shooter Tim Bradley. You will be hard pressed to find a nicer lodge, better food or more action when it comes to hunting pheasants. In fact 2018 will be our sixth year to hold this event, it has become so popular that it is a challenge for new hunters to join us, since our current hunters keep coming back year after year. If you’ve never upland hunted in the mountains where you can hear the echo of your shotgun blast each time you draw down on a pheasant, chukar or quail, you should consider one of our Colorado or Oregon outfitters. One of our favorite species growing up and a favorite for a parent, child hunt is turkey hunting! 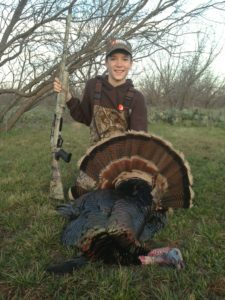 Turkey’s always provide plenty of entertainment for the younger hunters, holding their attention and for us, talking turkey talk is a great way to warm up for elk season. One of our favorite memories of turkey hunting was in Montana, just South of Hardin, when we were chasing Merriams. Theweather was not cooperating, it was still cold and it had started snowing! On our final set up for the morning, we positioned ourselves on top of a knoll, giving us a view from miles around and a direct view into the Pines, some 600 yards away. We were fortunate enough to have a tom hear us and watch him close the distance from over a quarter of a mile away! Watching him run through the snow to our calls is something we will never forget! Another hunt offering from Outdoor Solutions are some overlooked areas when it comes to waterfowl. Most people think of big game when you mention Montana but it is without a doubt an overlooked hot spot that you should consider. We hosted a waterfowl event with Yeti in 2017 with each hunter hitting their limits each day! One of our favorite waterfowl destinations is our home state of Oklahoma. Our outfitter in Western Oklahoma, along the Canadian River regularly has our clients limit out on multiple species each day. Oklahoma also has one of the most liberal daily bag limits for Canada geese in the US, when they increased their limit from 3 to 8 birds. If you prefer to warm up your passport and head out of the country, Outdoor Solutions has some outstanding choices, in Africa, New Zealand and Argentina. Experiencing new destinations, different cultures and unique hunting opportunities is one of our favorite things about our “jobs”. We have made some fantastic friends from other countries and will be happy to share our experiences with you. 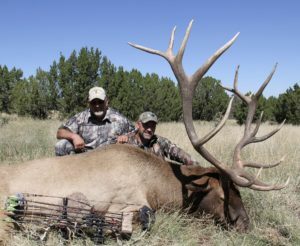 The last hunting opportunity we will leave you with is our Hosted Adventures program. You will have an opportunity to hunt with a member from the Outdoor Solutions team, along with one of our industry manufacturing partners where we include some of the best gear on the market with the hunt. Our past hosted adventures have included, waterfowl, turkey’s, elk, mule deer and antelope. We look forward to working with you and helping you plan your next hunt of a lifetime!